[Razr] used a CFL ballast to replace the mechanical one in his fluorescent tube light fixture. To make the drawers of his workbench more awesome [Rhys] used the faceplates from some servers. [Rich Olson] shouldn’t have any trouble getting out of bed now that his alarm clock literally shreds cash if he doesn’t shut it off. You may remember that post about a self-propelled snowboard. Here’s a similar project that uses a screw-drive system. And finally, if you need help reading a quadrature encoder from a microcontroller this lengthy technical post is the place to look. 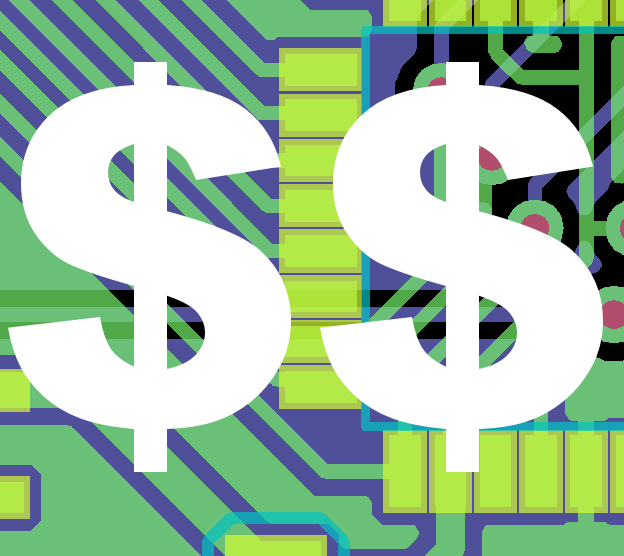 The prices for custom made circuit boards has never been cheaper, but surprisingly we’ve never seen a comparison of prices between the major board houses. [Brad] took the time to dig in to the price of 10 boards manufactured by Seeed Studios, OHS Park, and BatchPCB. He made some pretty graphs and also answered the question of where you can get your circuits made cheaply. [Brad] got the prices for boards up to 20 cm x 20 cm from Seeed Studio’s Fusion PCB service, OSH Park, and BatchPCB. These results were graphed with Octave and showed some rather surprising results. For boards over 20 cm2, the cheapest option is Seeed Studios. In fact, the price difference between Seeed and the other board houses for the maximum sized board is impressive; a 400 cm2 board from Seeed costs $150, while the same board from OSH Park is close to $1000. Of course most boards are much smaller, so the bottom line is for boards less than 20 cm2, your best bet is to go with OHS Park. If you don’t care when your boards arrive, or you need more than 10 or so, Seeed is the way to go. As far as the quality of the boards go, OSH Park is up there at the top as well. 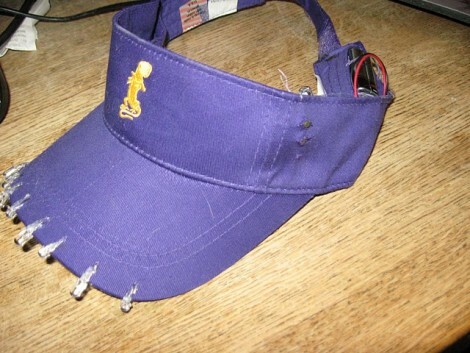 [Everett Tom] added some blinking LEDs to his visor while honing his PCB design skills at the same time. He started with the TI eZ430-F2013 for prototyping the blinking circuit along with its mode toggle buttons. Once this was worked out he used BatchPCB (a low-cost professional board fab option) to manufacture a board. The final design hosts an MSP430 F2013 microcontroller as well as the voltage regulator circuit that draws power from the 9V battery that hides inside the head band next to the board. You guessed it, video after the break. [Colin] has cut his teeth with about fifteen PCB orders. He wrote a tutorial describing the process and sharing his tips on avoiding common problems. You may remember our own How-To prepare designs for manufacture early last year. 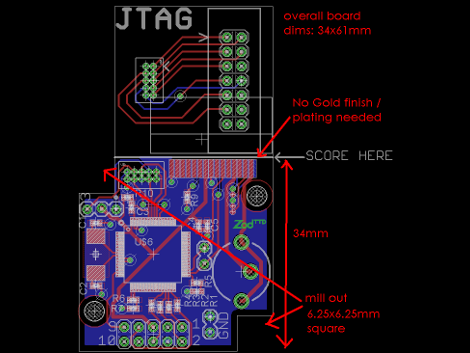 In that post, [Ian] shared his veteran knowledge by outlining BatchPCB’s board design process. This time, [Colin] is using Advanced Circuits in Colorado as a board house, giving us more insight on how the different companies work. No matter who you choose for manufacturing, make sure you really understand how to properly format and troubleshoot your designs. It’ll end up saving you a lot of time and money. SparkFun’s BatchPCB has been a well-known service to get your PCBs fabbed, and now it is sporting a new feature. It has just come out of its downtime chrysalis with the ability to pay you for making your designs. If you have designed a PCB and want people to pay you to use it, BatchPCB will now do that for you. [Patrick] says “We want engineers to benefit from the low-cost production for prototypes and have the ability to sell their work, conveniently.” There are a few caveats. First of all, each seller must be a resident of the United States and send BatchPCB a W-9. Secondly, PCBs are only warranted against manufacturing defects, so buyers should make sure the PCB they are buying is a working design. Finally, the sellers must only be selling designs of their own or with proper permission. We are big fans of free, open-source designs, but we can see how this would help an engineer recover some of their costs to develop a board and might lead to some interesting brokering of designs. What do you think of this new service? [Michael] has a keypad in his previous car’s door and he missed it enough to hack one into his Dodge Caliber. He bought a Ford keypad and mounted it inside his door with some custom electronics. He started with an Arduino nano to receive and authenticate button presses. This then splices into wires in the door that control the door lock. The program has a 5-digit code to unlock the door, but simply pressing 1 twice will lock the doors. He also implemented a lockout feature to prevent people from brute-forcing the combination. Although it isn’t wireless, it’s significantly simpler. BatchPCB is a low-cost PCB manufacturing service run by retailer SparkFun in cooperation with Gold Phoenix. Using them, you can get your design prototyped for as little as $2.50 a sqin. We used the service in our “How-to: Prepare your Eagle designs for manufacture“. The service collects orders until they have enough to manufacture an entire panel. It may take time to get the boards back, but they’re high quality. BatchPCB just added a brand new feature: Now anyone can list their verfied design files on the ‘products‘ page for other hobbyists to order runs of. Yes, people could always upload free designs themselves, but this makes it much easier to order a board even if the designer has no plans of making a kit of it.